A tribe of shed enthusiasts create the perfect places to work - and play. Increasingly, folk are transforming their sheds into quirky creative spaces, and a new community of ‘sheddies’ is emerging. There’s even a national Shed of the Year competition, featured on the sheddies’ own TV show, Channel 4’s George Clarke’s Amazing Sheds. If you’re wondering what Jo Gosling (pictured above) does for a living, her shed is a dead give away. She and husband Clive run their VW theme wedding business, Pear Tree Weddings from their very own VW bus / shed which features a split windscreen just like the vintage campers and beetles they hire out. Inside their business HQ it’s more of the same - VW campervan memorabilia galore. The shed that doubles as a workplace is an increasingly popular way to enjoy all the comforts of an office without the commute. So-called ‘shedworking’ is a sheddie subculture in its own right and members include stockbrokers, designers and architects to name but a few. Sure you really need to make that commute? Virginia Woolf was inspired in hers, Roald Dahl drafted in his and JK Rowling is building a replica of Hagrid’s hut on her Scottish estate. Writers need a ‘plotting’ shed in the garden - a quiet place where they can listen to the muse and let their imaginations run free. As award-winning author Nicola Morgan says: “Having a place and time for work and only work, and a way to leave and mentally lock the door, is psychologically useful.” Nicola’s shed is well-known in writing circles as ‘The Crabbit Hutch’, because her über-honest writing advice has earned her the nickname The Crabbit Old Bat! Imagine getting the British Army to blow your shed to bits. That’s exactly what sculptor and installation artist Cornelia Parker did. After the blast, she collected up the many fragments of her detonated shed full of junk and suspended them to create what was to become her best known work, An Exploded View. If that sounds too destructive, you could always take a leaf out of ceramicist Lou Rota’s book. 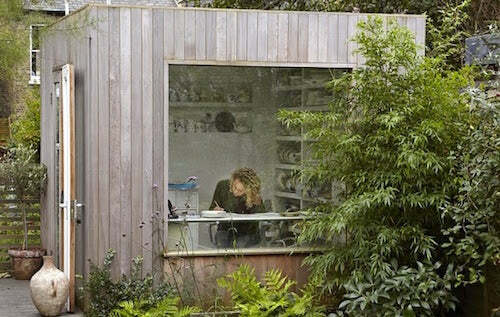 She uses her London garden shed as a studio in which to craft her stunning pottery. The pub shed is the perfect place for sheddies to hang out. But why stop at a pub when you can add a distillery, a farm shop, a ladies waiting room and a saloon bar? Walter Micklethwait did just that when he transformed his dilapidated Highland hen house into the hostelry you see above. On the ReaderSheds website Walter says: “Word got out that the bar was coming together and that we had juniper growing on the farm and before we knew it the shed became home to its very own gin distillery, complete with its own all Scottish gin brand, Crossbill.” The Inshriach Distillery won Shed of the Year in 2015. All aboard the Millennium Falcon! From big screen inspiration to something slightly smaller, you could always do what one sheddie did - turn your shed into a home cinema. Sheddie PJ says on ReaderSheds: “I used to have a home cinema in my living room when my girlfriend moved in it had to go, so I moved it to a shed!” His ‘Reelwood Cinema’ won the 2010 Shed of the Year competition in the ‘unique’ category. Every allotment needs a shed but whoever heard of a shed that’s also an allotment? Shed of the Year 2014 winner Joel Bird paints and makes music inside his shed - and grows a variety of veg on the roof. If you’ve ever coveted a shed with a lot more going for it than an outdoor junk room, there’s plenty of inspiration to be found by tapping into the sheddie community. From Twitter (#sheddies) to Pinterest to blogs (e.g. www.shedblog.co.uk), there’s a shed load of creativity out there.